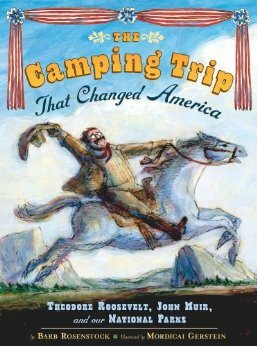 Last week's Environmental Book Club post dealt with The Camping Trip That Changed America by Barb Rosenstock. It's an account of the famous Teddy Roosevelt/John Muir camping trip. As luck would have it, PBS is running a series this week, The National Parks: America's Best Idea and who should be mentioned in it but John Muir? The show runs for five nights, and I've only watched a few moments here and there on two of them. I believe Muir was talked about both evenings. This being PBS, a companion book accompanies the series. Wouldn't it have been terrific if a companion children's book accompanied it as well? Since one doesn't, why not use The Camping Trip That Changed America? I don't think you need to be concerned if you've missed the first few nights of The National Parks: America's Best Idea. This is one of those Ken Burns' deals, so PBS will probably be rerunning it for the rest of this decade. Plus there's a DVD boxed set that you can ask for for Christmas, which is how a lot of PBS programming has ended up on our shelves.